I was wondering if any of you have a "Beware of Dog" and/or '"No Trespassing" signs on your property. And are you worried about liability if your dogs were to bite a strange who manages to get on your property. in FL, as of a new law a few years ago, it is now legal to shoot [ to kill ] trespassers & you will not be held liable. I wonder...if a dog bites a trespasser if it's considered the same, or if you're held liable. Interesting. My neighbors have a very intimidating looking mix that always makes a scene whenever someone approaches their house but he's actually an extremely friendly dog. Had i not known the dog personally i would imagine a stranger to be a little scared about trespassing into the yard. we don't but the law in the uk is very odd when it comes to beware of the dog signs, the reason we don't is if we have the sign and someone breaks in and they get bitten then we have already admitting that our dog is a danger so are there for open to prosecution and in all likeliness would have our dog removed an pts. although i have been told by other dog owners that its ok to have a dog running free sign, our local police dog unit adviced us to not use anything at all. so on the off chance someone did break in and ven bite we can say we had no clue she would be aggressive and then would have no liability at all. there are also local bylaws that get even more confusing regarding guard dogs etc but as i'd never consider encouraging an akita to guard its not something we would even look into. But isn't that what people always say on the news when a dog bites someone? "i had NO idea! She's NEVER done anything like that at all. It was completely without warning!" and thus we end up with "well it must be the breed, then." I just finished reading The Pit Bull Placebo (free download if you can stand to read 200+ pages on a screen- I think it was at BadRap.) and I encourage everyone to read it regardless of what breeds you love. The author discusses dog bite reporting from the 1880's to now, which has changed a lot!, dogs in popular media, and a pattern of demonizing breeds. Over and Over again. (bloodhounds, newfies, dobies, gsd, st bernards, sled dogs, rotts, pits...) One of the points she makes is how when caught we (historically humans) feign ignorance and put all the blame on the dog or the breed for our own evil doings- what we ask/train/force the dogs to do (guard, fight etc), or when we neglect and abuse them then people fail to take responsibility and just hang the dogs out to dry. (I had No idea!) Some best friend. A difference was that in the 1880's to about the dawn of tv news competition reporter actually wrote that the dog was being kept as a guard dog, that the kids were teasing it, that it had been chained and neglected. It's maddening that this UK law essentially perpetuates the "Who knew?" response. We dont have any sign on our yard, but a very good fence- 6 foot high solid fencing on the road side of the fence- the other sides are 4 feet woven wire mesh and bordered by woods. I do not leave my dogs out unsupervised where any kid could go around through the trees and attempt to interact with them. Many people find my dogs scary looking, even when they are being still and calm, and only rarely have I had anyone rush up to see them. I do not have signs. Mostly because my dogs are NEVER unattended. If they are in the yard, I am. If I go inside for a second, they come with me. Mostly because both Miko and Ruby are the kind of dogs that would easily be stolen. Oddly despite the fact that pit bulls are overrun shelters, and those of us who work in rescue are always desperate to find homes for wonderful pit bulls, they are still regularly stolen right from peoples yards. Pit Bull Placebo is brilliant, and I agree an absolute must read. On dobermans, I knew one scary one. And it further proves that it a dogs back story is very relevant. Her name was Sandy. She was terrified of children and tall men with hats. Sandy had been tortured by her previous owners. The man of the house would put out cigarettes on the poor girl and his son broke a bottle over her head. It is no wonder she was terrified often. I was 8 when I knew her, and I was the only child she didn't growl at (although in hindsight I am still shocked my mom and dad let me play with her). She regularly growled at my father and my sister, and bit her owners grandson. She was fortunate enough that her family knew and understood her story. She is the only scary doby I have known. Jay's grandfather always had dobermans. And they were essentially perfect dogs. My family raised and bred, GSDs. They were hugs, and I am sure plenty of people were afraid of them. But these dogs were the most gentle precious dogs ever. Any way I have no signs. And do my best to never have anyone around my dogs without me present. They are very very friendly dog but I still don't ever want to set them up for failure. I used to have a 'Beware of Attack Bird' sign above the parrot cage and that's about my style...if I did have a sign it would be more for the cute than the functional (unless it was required for some reason)...that beind said, Ki isn't ever left in a yard so I wouldn't really find the need for a serious warning. My family in New Mexico had a Great Pyrenees and a tiny long-haired Doxie and were required to have a Beware of Dog sign on the fence to their yard...because a neighbor kid ran over and picked the old Doxie up and got a good nip on the hand. Heather the Pyr is the sweetest (dumbest) dog ever but people assume the sign is about her. I was wondering if any of you have a "Beware of Dog" and/or '"No Trespassing" signs on your property. And are you worried about liability if your dogs were to bite a strange who manages to get on your property. Obviously, that doesn't protect us from a criminal suite, but it will cover the costs of legal and hospital. They will also fight for you in court. I think we are going to put up both signs on our fencing all the way around. I was reading up on some Washington State laws and they have a chasing livestock statue, it states if an animal runs on their property and chases any of their livestock they are within their right to shoot it. So we are definitely going to have to put up a tall fence. Everyone around here has animals: horses, llamas, pigs, reindeer etc and god forbid one of my pups decided to give chase and leaped over. is wearing a muzzle an admission of guilt by the same token? hmmm, I will think more about the "Beware of Dog" sign. -- I think it probably is, but it is also a legitimate preventive measure - a sign is not. With a muzzle the dog cannot bite, even if the person doesn't get the "message"... With a sign, the dog can still bite - and young children might not be able to read signs. Also, we (sometimes) use our muzzles when we are in public, but in the case of a sign the dog is not in public. When someone approaches the house Luytiy & Masha makes A LOT OF NOISE. I mean, they make it VERY CLEAR you should not be here. With Blue and our Akita, not so much. They may bark, but they do not sound as "viscous" as the CO. But if you got in our yard I think you have just as likely of a chance of being bitten by Blue as you do Luytiy, and the Akita a close second. So, I wonder if Luytiy & Masha actually help to reduce our liability exposure? I mean, aren't they basically just a VERY BIG "Beware of Dog" sign? Perhaps having a very nasty sounding dog helps to protect people from being bit by our Akita or CC? I really want the "forget the dog, beware of owner" sign. Well at my residence the sign on the fence reads as follows: "Don't worry about the dog, beware of owner with the 45".Gen, Ami, Kaylynn, Trinity, Yusuke......Riki, Hana, Sammi, Taro, and the newest addition Koyuki. I like that one Rina! I was curious about the beware of dog sign as I had heard it both ways - A) you are admitting there is a reason to beware of your dog and should know something may happen so will be more likely to be found guilty; B) you are trying to be preventative and therefore would have less liability as you have already "warned" people. The first always seemed more accurate, but I was never sure. I think it just mean to be cautious or weary that there is a dog on property, a heads up if you will. 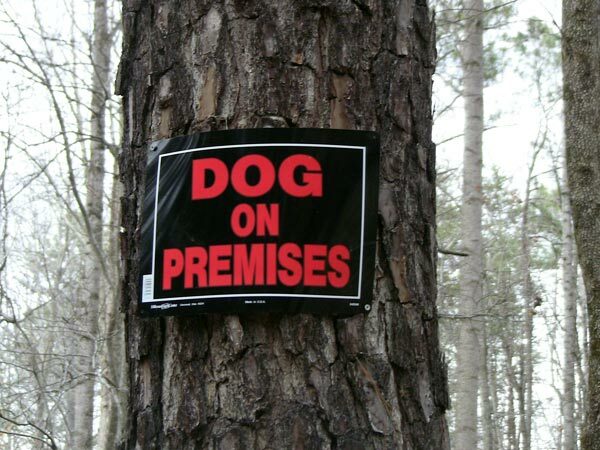 I don't think it is the same as "Dangerous Dog on Premises/Property". I live in Birmingham, UK and have a "Caution - Dogs Running Free" sign at the front of my property and along the fencing along the sides and rear of my back garden I have signs dotted at regular intervals that are easily visible stating "No liability will be accepted for any injury or damage to trespassers or their property". Should anyone choose to break in, they will have definitely seen the signs and take their chances wih the 4 dogs I have here (2 GSDs, 1 GSD/Akita, 1 Norwegian Buhund). So in a nutshell, should someone trespass on my property, whether they get their clothes and skin ripped to bits on the razor wire just inside my property at the top of the fencing, or whether they get partially eaten by the dogs is their problem. Of course there is always the muppet who tries to burgle a property then blame the property owners when they get hurt. Fortunately I was legally trained whilst a Police Officer. During that time it became clear to me that most Officers don't know anything more than the basic criminal law they work with on a day to day basis - and even then it's ignored if it doesn't fit in with the relevant force policy. I was told by someone (can't remember who), to use a sign that says Dog on Premises... by using a sign saying Beware its admitting your dog is dangerous. I think you really have to check into your state and local ordinances throughly to be sure of the best method. I have heard of people being bitten by a dog while robbing someone and sueing and winning, and the trespassing thing can also vary fromstate to state and township to township. I feel it is a persons right to protect their property. I would not post a "beware of dog" sign. I would not want to warn an intruder to watch out for, or to befriend my dog. My dog's bark should be ample warning enough. I have never needed a dog for protection, but they do the job very well. My father sold security systems in Detroit for many years and found out, to post "This Home Protected by ..." only got your phone lines cut before your windows were broke and your stuff stolen. Best to have a concealed weapon, than one that warns your assailant. I use a Dog on Premises sign that was given to me by my local fire department so they can know who and what to save in case of a fire. It's a clear way to mark your home for having a dog. Dogs are the number one deterrent from strangers entering your yard/home. The signs good because it gives warning, but with a city issued sticker. I feel like no one can hold me liable for that. Like Tara I have sticker on my doors that states how many dogs, cats, and chinchilla's are on premises for rescuing purposes. I like that it notifies people entering that there are animals there, but it isn't warning them about the animals, just that they live there. I got this from: http://doglaw.hugpug.com/doglaw_082.html It seems to make sense to me. Was the Injured Person Trespassing? In most states, dog owners aren't liable to trespassers who are injured by a dog. But the rules are convoluted and vary significantly from state to state. In general, a trespasser is someone who wasn't invited on the property. Unless you warn people off your property with signs or locked gates, you are considered to have given an "implied invitation" to members of the public to approach your door on common errands - for example, to speak with you, try to sell you something, or ask directions. A general rule is that a dog owner who could reasonably expect someone to be on the property is probably going to be liable for any injury that person suffers. This rule is particularly important when it comes to children. Even a dog owner who does not explicitly invite a neighborhood child onto the property will probably be held liable if it's reasonable to know the child is likely to wander in - and dogs are a big attraction to children. In other words, there is a legal responsibility either to prevent the child from coming on the property or to keep the dog from injuring the child. Specific legal rules that determine whether or not a dog owner is liable to an injured trespasser vary from state to state. Here are the basics. Dog-bite statutes. Most dog-bite statutes do not allow trespassers to sue for an injury. The owner is liable only if the person injured by a dog was in a public place or "lawfully in a private place." That means that the injured person must have a good reason for being where he was. Mail carriers, for example, are always covered. Police officers performing their official duties are not considered trespassers, either.41 Neither is anyone else who has an invitation, express or implied, to be on the dog owner's property. Another way courts get around an unfair result is by allowing the dog owner to charge that the victim, by trespassing, either was partly to blame (see "Was the Injured Person Careless?" below) or knowingly took the risk of injury (see discussion above). If the dog owner can prove either of those circumstances, liability may be reduced or eliminated altogether. Negligence. The states don't agree on whether or not an injured trespasser who sues a dog owner for negligence (unreasonable carelessness) can win. In some states, an injured trespasser can sue and win if the dog owner acted unreasonably under the circumstances. Reminder. Injured people can and do sue on more than one legal theory. So someone might raise two claims in a lawsuit, one under a state's dog-bite statute and one based on the common law theory. From the sounds of that article, the best move is to blanket your property with "property protected by" signs or simply no tresspassing signs as they don't convey danger from the dog or implied permission. "Beware of dog" or "warning....." signs would seem to admit fault in knowing the dog is dangerous and therefore increase your liability. Of course thats all assuming this website is correctly interpreting the law. Dave, proudly owned by Joey (Shiba Inu), Tyson (Kai Ken), and PRG's Mason Julien McDieserton III, a.k.a. Diesel (Labrador Retriever). "My opinion may have changed, but not the fact that I'm right"
After my ordeal earlier this year, I have no trespassing signs and no soliciting signs posted and have also installed a lock on the gate to my backyard. If anyone is dumb enough to open the front gate while the dogs are in the front yard with me yelling at them to not open said gate, then it is their own stupid fault if they get eaten by Bella. I have also worked with Bella so that if someone knocks on the door, she can go bonkers and bark/growl, but she has to be leashed before I open the door. So far, that has worked very well. I've been considering putting up "Guard Dog On Duty" and "No Trespassing" signs since that random dude wondered by our fence. It seems the best thing is something that makes it known that others are not welcome on the property, and informing of the presence of dogs, without making any comment on the dogs being dangerous. 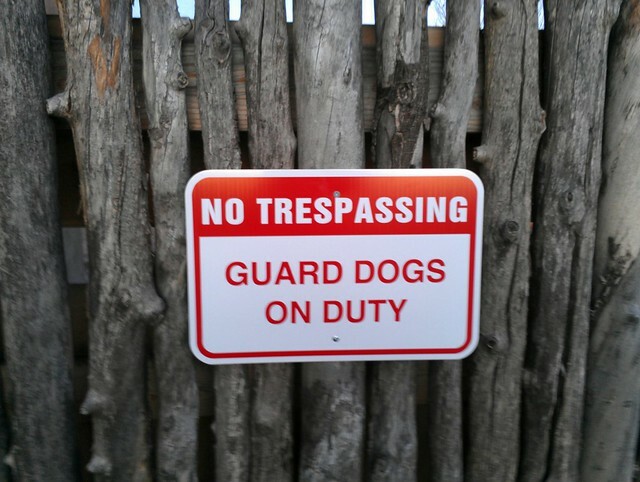 I think I'd prefer "No Trespassing: Dogs on Premises" or "No Trespassing: Watch Dogs on Duty." I like the sign, Brad... But like Heidi, I think a sign that said "No Trespassing: Dogs on Premises" would be less likely to throw up any liability issues. It seems to me that as dog owners we should all carry homeowners or renters insurance. We should have a general liability umbrella as well. People can sue anyone in the US and for the most part these policies will cover you. 1st: "A general rule is that a dog owner who could reasonably expect someone to be on the property is probably going to be liable for any injury that person suffers." 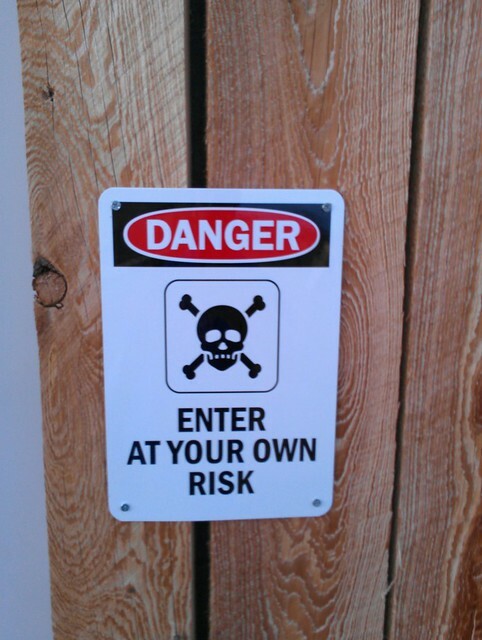 So if I post a no trespassing or private property sign on my access ways at my house. I am saying that I do not expect a person to enter that way without my permission. I also have to think about kids and consider will they read those signs? No they wont! So I need to make sure that those gates are secured/locked. Remember a sign saying dog can be inviting to kids. So the message I want being conveyed is that you do not have my invitation. 2nd: " Common law rule. If the state follows the common law rule - which imposes liability on a dog owner who knew a dog was dangerous - technically, the fact that the injured person was trespassing doesn't matter. So if the common law rule were applied strictly, if you know your dog is dangerous, and it bites a burglar who breaks into your house, you're liable." The article goes on to say that this doesn't quite happen in practice but it's still something that we need to consider. So, I'm not going to post any Beware of Dog, My toy poodle will eat you signs. It is well documented that all dogs can bite people but it is also equally documented that there is a "banned dog list". When buying Kaeda I thought about this when purchasing my liability insurance. I found a company that doesn't have akita on their list. At the time of purchasing the policy, I had to have Kaeda listed by breed on the policy. So I had her listed as "Japanese Akita". The insurance company ask what's the difference? I pointed out that Kaeda has a pedigree( akiho) that wont let her bed registered in the US as an Akita (AKC). I emailed them a quick article explaining how they are two different breeds outside the US. This is important because, she is a Japanese Akita and is not a dangerous dog. I am not sure if this would work in court but I don't think it would really hurt either. We also need to be careful what we say on the internet. I've seen a few craptastic post on this forum and other places, asking about how certain dogs do in certain situations. I own a mustang and on one of the mustang forums as member bragged about racing his car on the track then taking it to the dealer for warranty work. The dealer used the forums for their defense. Just more food for thought. Heidi, I love that GSD pic! Sean, thanks for your posts too. Lots to think about. I will likely change out my signs. I have 1/2 acre, but the whole thing is fenced in; just to get to the door or even the garage, you have to come in the gate. The dogs are never out unless we are home, but we never leave the gate open, so sometimes it's hard to tell if a dog is out (Toby's lazy and doesn't always go to the gate). I just have a standard beware of dog because I want people aware that there are dogs in here and they should not open the gate. Some proselytizers do come in anyway. Once some Mormons, who told me rather sanctimoniously that he'd happily "get bit if it meant saving a soul." I wanted to bite him for that! Luckily that was when I had my GSD who tracked the guy to the door barking, but did not bite. I've had a talk with the meter reader, and we've come to an agreement. He honks his horn, and the waits, and if no one (canine or human) he knows he can come in. But I would like to have signs. The people with mastiffs down the street have the same type of sign as the GSD above. I might just get some "Dogs on Premises" signs to replace my beware of dog. Or maybe no trespassing--that's what most people here have on their dog yards, and I suspect now it is for legal reasons. I'm lucky that my insurance does not say anything about dog breeds. I have Farmers insurance. They've had to pay out on a dog related claim (when my GSD destroyed the fender of my friend's car) and they said they take it by incident, rather than by breed, and they do consider property damage different than injuring a person. Under the common law rule, a dog's owner or keeper is liable for injuries the dog causes only if the owner knew or had reason to know that the dog was likely to cause that kind of injury. So if your dog tries to bite someone, from that moment on you're on notice that the dog is dangerous, and you will be liable if the dog later bites someone. The common law rule comes into play only if the state has no dog-bite statute or if the statute doesn't apply—for example, if the statute covers only bites, and the dog caused the injury by knocking the person down. A dog owner may be able to escape liability by proving that the injured person provoked the injury, or voluntarily and knowingly risked being injured by the dog. The logic of this legal doctrine is straightforward, if not unquestionable. This rule allows a person who owns a dog to assume, until there is some concrete indication to the contrary, that the dog isn't dangerous. But an owner who knows a dog poses a particular kind of risk to people must take action to prevent the foreseeable injury—or be prepared to pay for it. The common law rule is often called the "one-bite" rule, which is a bit of a misnomer. It implies that every dog gets one "free" bite (free for its owner), and from then on the owner is on notice that the dog is dangerous. It's true that if a dog bites someone, its owner is definitely on notice that the dog is dangerous; but less serious behavior is also enough, legally, to give the owner the knowledge the law looks for. For example, if a dog growls or snaps at people, the owner knows (or should know) that the dog may cause injury. If the dog does hurt someone, the owner will be liable, even for the first bite. The test for liability is the same no matter how the injury was caused: Did the owner know of the dog's dangerous tendency? For example, if a dog jumps up and knocks someone down, the question is: Did the owner know of the dog's tendency to knock people down? If so, he's liable for it. Warning signs. Don't worry that putting up a "Beware of Dog" sign is tantamount to admitting that your dog is a menace, landing you in bigger trouble if the dog does ever hurt someone. First of all, the sign will help avoid bites—which is far preferable than winning a legal battle over a bite later. Second, if you think your dog might hurt someone, there's almost certainly already more evidence of the dog's dangerousness than the fact that you put up a warning sign. Judges often say that, to be liable under the common law rule, an owner must have known the dog was "vicious" or had a "vicious propensity." The term, as it's used in this context, simply means dangerous—likely to hurt someone, even if by being overly friendly. It has nothing to do with a dog's temperament. ^^So this would apply to Ahi, for example, who LOVES people but tends to jump on them and could knock them over. I agree with this section, and that is why I have started to consider adding a sign that clearly states that we have "Guard Dogs" and "No Trespassing" (accompanied with locked gates) - if it helps prevent a bite, and it makes it clear people are not welcomed here, someone being bitten by one of my dogs would have to have entered knowing the risk. This raises an interesting question for me. Tyson technically has a bite history. (For those that missed the story, search for my thread "A word of caution..."). He's not "vicious", nor do I consider him a bite risk in normal situations. His bite came because he was pressured by two vet techs with very poor judgement. IMO, pretty much any dog would have bitten in the situation Tyson did. But legally speaking, he's now more of a liability than other dogs if I'm reading that correctly. Does that mean I need to put signs up on my property? I've been told to NEVER put any "beware of dog" signs as well. So I have a sign that says, "Caution! Killer Cat!" but it is in German =p. ...turn off all security cameras. ...grab a shovel and dig large hole in the yard." I like the "No Trespassing", "Guard Dogs on Duty" & "Dog on Premises" signs. 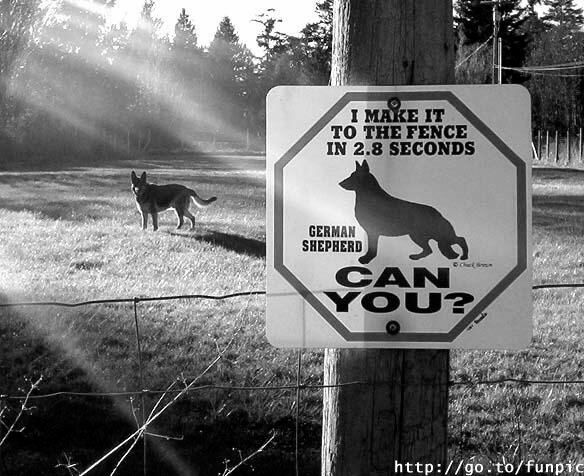 As well as the "I can make it to the fence in 2.8 seconds, CAN YOU? and the "Never mind the dog, beware of owner". @dlroberts - If anything, it'll mean to NOT put up any signs on your property unless the signs just imply that there is a dog on the property. I meant no "beware of dog" signs, LOL. If I am reading all this correctly, I am coming to the conclusion that it's best to do what ever you can to prevent a bite, and if that means putting up a sign warning of the danger of your dog then do it. If a person gets bit by your dog, and clear warning is given, then the person will have to somehow prove that he was unaware of the danger even tho there is a sign clearly warning of it. Also, if they are trespassing, it it's clear that they are (locked gates, no trespassing signs), then even if your dog has bitten someone in the past, as far as I can tell, that person will have a hard time suing over injury as they were breaking the law and trespassing. Thanks Brad, that's very useful! @Dave, I think, unfortunately, Tyson does have a history of biting now. I don't know what that means in your state. In NM, I know that technically if a dog is considered "dangerous" then you have to have a certain size fence etc. If I understood what my vet told me (and this seems reflected in Brad's post above) the first bite does not make a dog "dangerous," so you're not required to have all that stuff for one bite, but it does demonstrate a history, and if there was another bite, your dog could get the "dangerous" or "vicious" dog label. My vet said that even injuring another dog is enough to demonstrate history in NM, so Bel's attacks on Toby give her a "history" which means I would be in serious trouble if she ever bit a person. It's pretty hard to believe the knocking down would count towards this, isn't it? Oskar jumps on people all the time. (Akitas seem to love to get up all close and personal in their greetings) but he's the sweetest, softest dog possible with people. This all reminds me of the time when a teenager broke into my parent's house and dove in their pool sideways. He broke his neck and was terribly terribly injured. Then his parents sued my parents for the tune of $2m!!!! The pool was a lap pool, and they had signs up that said "no diving" with a picture of someone hitting their head and hurting themselves. The people who sued tried to say that my parents were liable for putting in a dangerous pool in their backyard. My parent's attorneys argued that they had warned anyone in their backyard of the danger of diving in a lap pool. BTW no one mentioned that this kid BROKE INTO their backyard. Long legal battle later, my parent's won the case, and more importantly AAA paid for all the legal costs minus their deductible and DID NOT drop them as their insurance company. The signs saved my parents from that and from their rates going up. If someone had a dog that has bitten before, reported or not, I WOULD put up a Beware of Dog sign. If your dog knows that they can use their mouth to protect themselves when threatened and shows that they would use their mouth to protect themselves from a stranger or to guard their house, then honestly, it's your responsibility to put up a sign. @dlroberts I don't know it's a bit of a gray area for you. I'm not sure if Tyson Chicken would bite a trespasser. @brada1878 I think Luytiy is sign enough personally!!! Maybe you should have adult diaper dispensers on your gate next to the sign? Like the dog poop bag dispensers at parks. 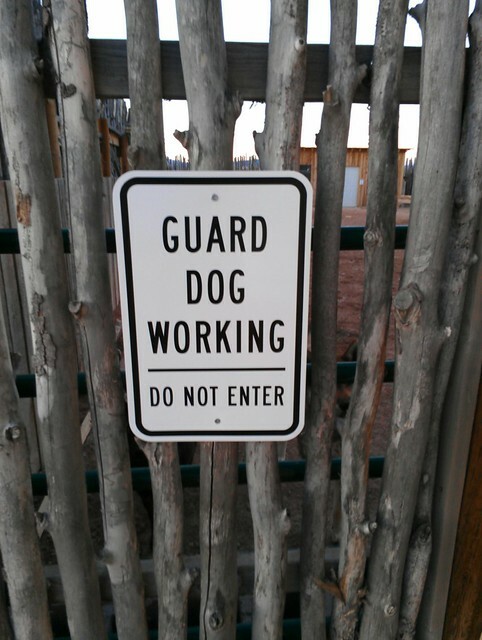 @shikokuspirit I think the guard dog sign should be saved for actual guardian breeds or working dogs. The never mind the dog actually says that the dog is not aggressive. If someone has an aggressive dog, then I would recommend not having that sign. What do you think? In San Diego, the advice distributed over the news is to not put up 'beware of dog' or even 'my dog can make it to the fence in --- sec, can you?' signs. Instead, it's 'dogs on premise'. In some areas of soCal, if a dog attacks a cat that wandered into his own confined yard, the dog can be considered a dangerous animal. Majorly stinks. I don't think I will need a sign for my place. Mika's bark and howl is enough to scare anyone off. She has such an intimidating bark for a 16 lb shiba lol. I bought a cute sign a while back at the 2010 pet expo that says "Caution Area Patrolled by Shiba Inu"
(vi) Which represents a continuing threat of serious harm to persons or animals. So, here it seems that a dog is not considered aggressive if it was provoked. Does intruding count as provoking? It also seems that your dog can kill a domestic animal on its own property without consequence. Interesting. If a Bylaw Officer deems your dog to be aggressive, they can order it euthanized, or return it to you, in which case they impose conditions such as muzzle requirements or leash length limits or mandatory rehabilitation program. Then you have to pay a special aggressive dog license. Damn. Bel falls into a lot of problem areas in Heidi's list. I guess I'm just seeing more and more reasons why my little Bel is quite a liability. Not that I don't already know that, but I guess this is the summer of that really starting to reach the tipping point. Did the Injured Person Know the Risk of Injury? In general, a trespasser is someone who wasn't invited on the property. Unless you warn people off your property with signs or locked gates, you are considered to have given an "implied invitation" to members of the public to approach your door on common errands—for example, to speak with you, try to sell you something, or ask directions. A general rule is that a dog owner who could reasonably expect someone to be on the property is probably going to be liable for any injury that person suffers. This rule is particularly important when it comes to children. Even a dog owner who does not explicitly invite a neighborhood child onto the property will probably be held liable if it's reasonable to know the child is likely to wander in—and dogs are a big attraction to children. In other words, there is a legal responsibility either to prevent the child from coming on the property or to keep the dog from injuring the child. Dog-bite statutes. Most dog-bite statutes do not allow trespassers to sue for an injury. The owner is liable only if the person injured by a dog was in a public place or "lawfully in a private place." That means that the injured person must have a good reason for being where he was. Mail carriers, for example, are always covered. Police officers performing their official duties are not considered trespassers, either. 41 Neither is anyone else who has an invitation, express or implied, to be on the dog owner's property. Wow, yeah...for sure it's better to play things super safe! @jujee - AND Kyuubi! He may not be "aggressive" but he is a FANTASTIC Alert Dog! He does kinda "guard" the property by investigating and "big dog" barking at unfamilar noises or strangers (my brother already has confused his bark with Shoushuus! I'm like, "No, that's Kyuubi - the PUPPY!"). He is happy and relaxed during the daylight hours but at night he is "on guard/on alert" and highly persistent if something isn't quite right or a stranger walks on to or near our property. Once he deems "a stranger" not a threat then he relaxes and does his own thing (whatever that is). Well the good news is that the two webpages that were cited seem to have very similar information. I think what we should do is create a sticky post of "advice" that sites both Common Law, Letter of the Law, and the spirit of the law examples. We can then have people reply with what each state does and where to look it up. Man I might as well write a JACA Quarterly Article on the subject as well. @Brad the Nolo article is the same as the other article. Any idea what the source is for this article? "The "business pursuits" exclusion. All insurance policies contain exclusions, clauses that say specific kinds of incidents aren't covered. Because homeowner's insurance is supposed to insure homes, not businesses, many homeowner's policies have a "business pursuits" exclusion. Such policies don't cover claims that arise from a homeowner's business activities. The exclusion may apply when an accident happens in the home even if the business conducted there is only a part-time activity. EXAMPLE: An Oklahoma man found his homeowner's insurance didn't cover him when a potential buyer was bitten while looking at a litter of St. Bernard puppies, which he kept at his home. The business pursuits exclusion applied, a court ruled, even though the man's primary occupation was as a salesman. The business activities in this case went beyond the infrequent sale of a litter of pups: the man had renovated his barn to use it as a kennel, and advertised dogs for sale in the newspaper and on a large sign. 67"
My liability has always told me that as long as it's a hobby. I may call them today and ask again for the exact clause. I put up a "Guard Dog on Duty" sign when I bought my new house, since I live in the city with rifraf occasionally coming through. I did worry how my neighbors would react though. Would they think badly of their new neighbor? Would they automatically avoid me and my "guard dogs" (which are greyhounds btw, lol)? Would they think negatively about my breed? Would they think I was some slouchy, irresponsible dog owner who didn't socialize or train their dogs, so they just threw up a sign instead b/c I was lazy? Does anyone else worry about how their signs make them look to other people? Or am I just neurotic? LOL. I ended up putting several No Trespassing signs up, so we are not liable - fortunately Washington State laws are pretty specific. I also put up Caution Dogs at Play signs, it doesn't have the negative connotation of Beware of Dog. Inu would bite if he was cornered and provoked, but he is covered under the state law for that. My biggest concern is someone trying to steal them. Everyone asks if Inu is part wolf and then most people seem kinda wary of him. If that keeps them from poking their fingers through the fence then good. On the drive home from my sister's house in Pennsylvania, on the state road, we go by a house with a HUGE sign- 5 or 6 feet tall- with large lettering and photos of the 2 dogs in question righ ton it. It says NO TRESPASSING, BEWARE OF DOGS!! WE BITE!!! Its certainly clear in meaning, and I laugh cause it is SO over the top. Most of the stories people here about outrageous torts suits are actually false. Also, at least one of the stories that partially true is actually a actually settlement that occurred back when California changed the legal standard for property liability to trespassers from willful or wanton action to "reasonable care." People weren't certain what reasonable care meant in the context of a trespasser, so they settled. However, based on case law it appears that it's actually a sliding scale---reasonableness for a guest is different from reasonableness for a trespasser. Also, another thing to remember is that anything that's not settled tends to go to a jury of people who think of trespassers just the way that you and I do. Thus they are unlikely to return a verdict in favor of a burglar. Furthermore appellate courts are very reluctant to overturn jury verdicts, so you're unlikely to see courts stepping in unless there is something other than the jury verdict being contested. Just thought I'd point this stuff out because I'm seeing a lot of false information on this thread. As a note, however, I would like to point out that I am not an attorney and this is not legal advice (I'm just a law student and all of this comes from my torts professor :D). If you need legal advice, speak to a lawyer, like Brad did. Tort law differs from state to state and only a lawyer licensed to practice in your state can give you legal advice. Our decision to add these sighs had less to do with the legal aspects of keeping guard dogs and more to do with simply keeping people safe. Since that's our first and most important goal - to prevent people from getting hurt. Reducing liability and such is smart, but if we can reduce the chances of someone getting hurt to begin with then that's the better plan. Bumping this because we just had a scary incident. We have one sign up on the gate, a generic beware of dog sign. I was at school, and my husband was home, and he'd just let the dogs in (thankfully) when someone knocked on the door and the dogs went nuts. Knocking on the door is a HUGE deal, because you have to through the fenced in yard to get to the door, so no one EVER comes here unannounced. My husband started to open the door, and the guy already had the screen door open, and was reaching, stupidly, for the regular door. Oskar, who is pretty mellow generally, just about broke through to get at the guy (I mean, Oskar only weighs 10 pounds less than my husband! ), and my husband had to slam the door and yell at the guy to step away from the door. (The guy was process server, by the way, serving me a subpoena in a court case--and this could have gone through the mail, so I have to admit a part of me hoped this scared the hell out of the guy, which apparently it did, once he was faced with a very upset Akita) Oskar was apparently pretty worked up. Of course, this was terribly stupid. The sign says beware of dog, and the guy did not honk his car horn at the gate or do anything to get attention before he came through the gate. But if the dogs had been out, but not immediately visible and he had come in, I think Oskar likely would have bit him. So I'm thinking of a new sign. Apparently "beware of dog" is not enough to warn people not to come into the yard. Maybe I should get one of the "guard dog on duty" signs? Unfortunately, most legal servers are idiots and think that they are above paying attention to signs. But from a 'guard dog' sign point... That is probably a good idea since Oskar really seems to get worked up with strangers knocking on the door. I was just talking to an attorney friend about this, and she said she said while where she's at (East coast) the process servers aren't usually that stupid, anyone going through a gate with a posted beware of dog sign up is doing what is called "assumption of risk" meaning he ignored the signs and if he got bit, it would be his fault. Of course, as we've discussed a lot in this thread, there is variance in local laws. And I really did think of what happened with you when this happened....I mean what the hell? Except this guy should have had some professional caution, as he was an adult. He was really shook up when he saw how big Oskar was though! And virtual (ie. non scary stranger) hugs to Nola. wow... that is scary! Glad no one was bit, and I'm sure it's nice to know Oskar will step up when he needs to. We have a huge "Guard Dogs on Duty" sign right by the front door. It's silly tho, because if you are that close to our front door and haven't figured out we have guard dogs then you must be too stupid to read a sign anyway. Brad, that made me laugh, but you know, I am constantly astounded by the stupidity of people! That's an interesting story, kinda scary, but still interesting. My dogs sound big and scary but once you open the door and step in, they are all lovey and will help you carry out the TV. Well, Conker isn't, he's the "alarm" dog and won't shut up unless I go see what the cause of the disturbance is. But the Girls? Nah, everybody is a friend. But yeah, the stupidity of people really astounds me sometimes. Good thread and, @shibamistress, that's a scary story about the process server! I've had two salesmen step over an iron gate on a small porch and walk through the open door into my house; fortunately, the Akitas I had then just smiled. With the blind Akita I have now, that wouldn't have ended well. I'm interested in the dog bite insurance Bard wrote about, http://www.xinsurance.com , and wondered if anyone else has bought it and if anyone has used it when a dog bit. My Akitas are covered under my umbrella policy homeowner's insurance but would having a separate insurance for dog bites would protect me from being dropped by my homeowner's insurance? Brad, not Bard--arthritic fingers and brain don't always work well. I don't know about what Brad has. I just have the regular homeowner's insurance. But having seen Brad's COs in action, well, all I can say is, anyone who so those dogs and still tried to come on the property would be too stupid to live. @shibamistress--ROFL, you made my day. But in America, someone would probably claim that that is an implicit invitation to come in. Only in the US, where one rewards stupidity. I saw one with a picture of a Shiba, teeth bared and all nasty looking, that said "Guarded by attack Shiba" and wanted to get it but it was something like $50. Too much for a sign for me. I'm pretty certain my Lapphund wouldn't bite anyone (she barks and howls, but her bite thresholds are such that the chances of her even putting her mouth on someone are very low, and she's only ever growled at one person)--but I try to be aware of these things anyway. I'd always read it's best not to have a Beware of Dog sign unless you're afraid you might actually need it, and then just to be aware. But what I really wanted to say was just what the signs I saw all over the place (once fences and gates) in Ukraine said. The majority of the "Beware of Dog" type signs--or even just paint scrawled across a fence--say ОБЕРЕЖНО! ЗЛАЯ СОБАКА!--that is, in the more comical way it can be translated, "Careful! Evil dog!" but really is going for more "Careful--bad-tempered dog." I preferred to translate it as "evil dog" though, because it amused me more that way. Yeah, in Poland I saw zly piesky (not sure I've spelled that right, it's been many years since I lived in Poland) which is "bad dog") I do like "evil dog"! In FL it's actually strict liability for dog bites, means you are liable when your dog bites someone, period. Now there are defenses to that, i.e. if you put up "Bad Dog" signs on your yard and someone trespasses your yard, you have a defense to liability. BUT, if a child < 6 enters your yard you are STILL liable. Search your state's statutes. There's usually a dog bite one.